September has finally come! We’ve been anticipating its arrival for some time – it’s the month when our schedules begin to get busy (read “busier”!) and we may not get much time to stop and breathe for a while. Apart from 2 short breaks for a long weekend (April and June) we’ve also not had any “holiday” since January – so we’re especially excited about a trip to USA (10th to 24th October) for Sherree’s brother’s wedding on Saturday 17th. Every 3-4 years, SIM Treasurers from around the world get together for a conference/training. The last 2 Treasurers conferences (2008 and 2012) were held in USA – but this time Steve doesn’t get to travel anywhere exotic or different, because the conference is being held in Chiang Mai! It’s also being combined with a conference/training for many SIM Project Coordinators – so there are about 80 participants descending on Chiang Mai this week. A few already arrived early last week – and everyone else is coming over the next 3 days. Steve is going to the airport at 11pm tonight to meet the main conference organizer, and to hand over some petty cash to him. We still don’t know if some of the African delegates are going to be able to make it – 2 Nigerian staff and 1 Burkinabe staff have really struggled to get Thailand visas…….the Nigerian staff couldn’t get visas for either of the last 2 conferences in USA – so we had really hoped that Thailand would be easier, but so far that hasn’t been the case. Please pray, even at this late stage, that they’ll be granted visas and be able to travel. Pray for those coming from many different countries (including an Ebola survivor from Liberia) – that they’ll have safety in their flights, good connections, and no problems with Thai Immigration. The conference runs from 17th to 24th September. Steve will attend all the sessions as a day visitor, and Sherree will work from home. And we’ll look forward to catching up with many old (i.e. known) and new friends over meals during the next 10 days. We’ll have a few days to regroup after the conference before flying off to a regional Council meeting from 29th September to 3rd October. Then we’ll be back home for 3 days to check emails, catch-up on our backlogs (including financial year-end for Steve which is 30th September), do our laundry – before flying to Bangkok on 7th October to renew our visas and Steve’s work permit (hopefully on 8th October, and with extra time on 9th if necessary). Please pray that our visa renewals go quickly and without problems – because we head to the airport on the evening of 9th October to fly out to USA for our 2-week holiday that we’ve been looking forward to for so long – yay! Please also pray for our workloads – during our travels or absence from our desks, there’s no-one really stepping in to do our work – so we’ll be managing things as best we can during this time…….please pray for no crises or emergencies. A Canadian running friend of Steve’s (Ryan) who lives here in Chiang Mai has recently shown interest in Christian things……..his Thai language teacher (who is a Christian) was talking to him about her faith a few months ago, and he was interested to find out more, so started attending her Thai church. He was (and still is) the only foreigner there, but he has really enjoyed the fellowship and friendship that the Thai Christians have shown to him. (He has also got to know Steve and a couple of other missionaries in Chiang Mai who are runners over the past 1-2 years). Ryan has recently been to the International English-speaking church with us on Sunday afternoons, and is keen to keep coming and learning more. Last week we invited him to our home for dinner, and he was so excited to have a home-cooked meal that was 100% vegan (he’s a fairly strict vegan, and finds very few people who understand or enjoy eating a vegan diet!) – and also at the same time we enjoyed discussing some of his questions about the Church, Christianity, etc. He’s interested in starting a weekly Bible study together – so please pray that we’ll be able to encourage him in that – when we’re here! Thanks again for your love and support for us……and for praying for us over the next 6 weeks of busy-ness. Yesterday (Saturday) we went on a little thiaw (outing) on our bike to an area 20km (12 miles) north of Chiang Mai…….into a more rural area where he’d heard about the Lucky Bunny Café. Steve used to raise rabbits and is a real softie with rabbits – this café has about 30 different rabbits (in cages) and they use the place to educate Thais about how to care for rabbits well. They run a 90-minute show 3 times per day – you get a chance to pet and feed many of them during the show. 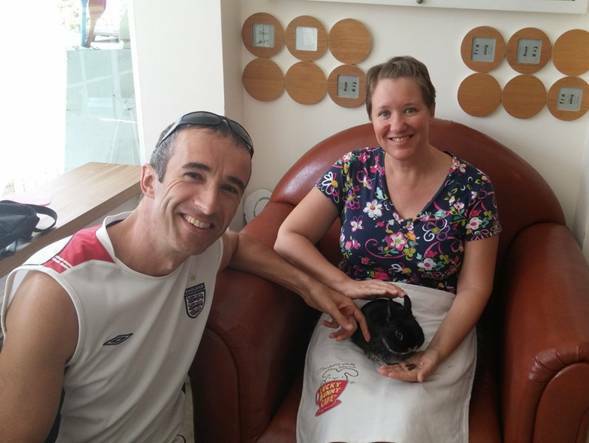 Afterwards you can choose your favourite to have a photo with……..we chose this black Netherland dwarf rabbit – the breed that Steve had as a child…….